You Are Having A Baby. Now, How Do You Pay for It? 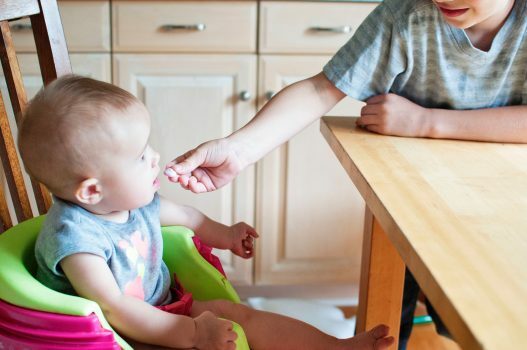 What Are the Average Costs of a Baby in the First Year? 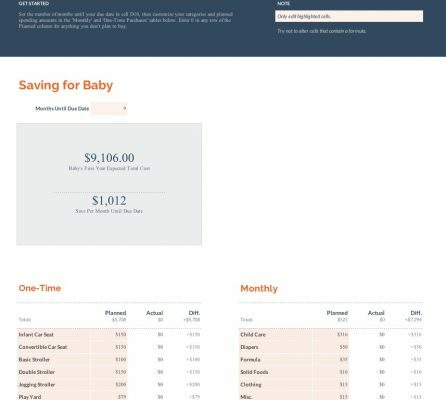 So, like the personal finance nerd that I am, I obsessively started researching how much a baby costs. And what I found shocked me. In 2015, the USDA (United States Department of Agricultrue) published a report that stated the cost of a first child’s first year was a mind-blowing $12,980. And that doesn’t include the costs of labor and delivery. Twelve. Thousand. Dollars. My jaw literally dropped. There was no way we’d be able to save that kind of money before we had a baby! But after doing a little more research and creating my own list of what we’d actually need, my worries faded. A baby was going to cost much, much less than $12,980. In fact, my daughter just celebrated her first birthday, and after doing a bit of nerdy spreadsheet work, I discovered that her first year cost….$1,258. That’s right, less than 10% of the national average. (That number does not include labor and delivery or insurance premiums. Those numbers are given later in this article.) Much of our savings we can attribute to the generosity of friends and family who gave us gifts at our baby shower, or graciously handed down their previously used items. So to be fair, that cost may have been higher if we didn’t have great support, but still nowhere near $12,980. In this article, I’ll note what we were given in each category and what it would have cost if we had purchased it ourselves. Before our daughter was born, I was working part-time for a software company. When I got pregnant, we immediately stopped spending anything I was making. We’d always saved the majority of my paycheck anyway, so this wasn’t a drastic financial shift for us. We use a budgeting software called You Need a Budget, and it made it easy to put my income into our savings. My paycheck was split into a few categories: 10% went to our charitable giving, 45% went to our “Babies” fund, and 45% went to our retirement savings. After 9 months, we had $1000 in our “Babies” fund. Because I’d planned out our spending for baby’s first year, I knew we were really close to what we needed. With our careful budgeting in You Need a Budget, I also knew we had some wiggle room in my husband’s salary to cover the difference. Diapering is the big baby cost that you can’t get around (at least in the US. China seems to have it figured out). We spent $282 on disposable diapers and wipes the first year. We were gifted a few Amazon gift cards that we used to order three boxes of diapers, so realistically, that cost would have been closer to $350. What is needed for a cloth diaper kit? Diaper refresher kits to replace the worn out velcro and elastic on the used diaper shells (to be honest, it turned out to be a HUGE project). Now we use a combination of disposable and cloth, which has cut our monthly diapering cost by ~60%. So should you do disposable or cloth diapers? It depends. Let’s assume your child will be in diapers for two years. In disposables, that total cost will be $700. And if you decide to have a second child later on, that cost will be an additional $700, for a total of $1400. But they are so easy and so convenient, which is worth a lot in New Parent Land. Plus, let’s consider the environmental cost. Two years of disposable diapering will generate about 2,000 pounds of non-biodegradable waste: a literal ton of garbage. Buying cheaper diaper brands would potentially save you $150 per year, but I didn’t find that it was worth it. 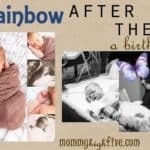 Cheap diapers (Luvs, Up and Up, Parent’s Choice) needed to be changed more often and gave my baby diaper rash, so we stuck with Huggies almost exclusively. Cloth diapers, if you were to buy a supply new, would cost $300-$500. That would last for the full two years, plus the two years of a possible second child. This would potentially save you about $1700 for two children or about $350 for one child. The savings is obvious at first glance, but cloth diapering has its drawbacks. It takes time to wash cloth diapers: about the same as a regular load of laundry. It is less convenient to change a cloth diaper. Stuffing an insert, tucking in the diaper liner, and snapping it closed seems like it wouldn’t take that long, but throw in a flopping and screaming toddler, and it takes an eternity. Cloth diapers are super stinky when dirty. They need to be kept in a well-sealed diaper pail or zippered wet bag, or they will make your whole house smell like a barnyard. But keep them closed up and washed frequently, and they are not any worse than disposables. So it’s really up to you and your situation. 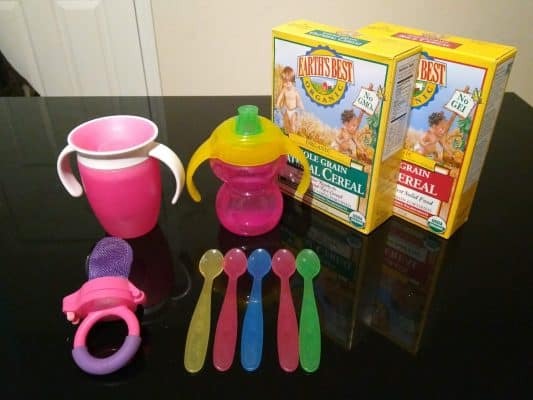 If your child will be in daycare or with Grandma most of the time, and you plan on only having one child, maybe disposables make the most sense for you. Or maybe your sanity is worth the money. 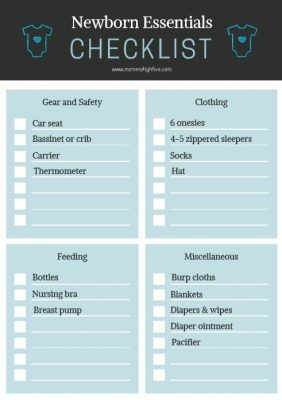 But if you will be home with your baby most of the day, and are willing to commit to cloth, they are a great way to save money long term. I personally love doing a combination of cloth and disposable. We use disposables when we’re out and about, traveling, on wash days, and overnight. But cloth diapers work great for days when we’re home together, and it saves us 60% on diapering every month. Unlike diapers, it’s really easy to lower your clothing cost. We spent $127 on clothing because we were fortunate to get a lot of gifts. We got three garbage bags full of hand-me-downs. Quite a bit of that clothing was in poor condition, out of style, or duplicated, so we ended up keeping a third of it. We also received quite a few new outfits at my baby shower. Had we purchased all of her clothes, I estimate that we would have spent $200. The used clothing was purchased from three different sources. Garage sales are my favorite way to buy baby clothing. Typical garage prices are 10% of what the items would cost new, so it’s by far the cheapest way to shop. If you want to find great deals at garage sales, it takes a little strategy. Check Facebook Marketplace, Craigslist, and local newspaper for ads on Friday and make a list of the top 2-4 sales you want to visit on Saturday. Look for ads that have addresses in nice neighborhoods and list items you need. Don’t bother going on Saturday to a sale that started on Friday because all the good stuff will be gone. Get up early and be at the sale right when it starts. Garage sale shopping takes patience, but not a lot of time. We only go from 8-9 am every Saturday. After 9, we assume everything good has already been sold, so we head home to start our day. The second place I buy used clothing is thrift and consignment stores. We have three different thrift stores nearby and a Once Upon a Child store (similar to a Kid-to-Kid store). Thrift stores typically are priced at 10-30% of what you’d pay new, and consignment stores are usually 50%. Monday and Tuesday are the best days to shop at thrift stores because they get so many donations over the weekends. A couple of our local thrift stores will run big sales a few times during the month, marking most items down 50%. I signed up for Once Upon a Child’s email list, so I get notified when they run their big end of season clearance sales. A few of the items were purchased from individuals on Craigslist or Facebook Marketplace. The pricing is typically similar to thrift stores, but I have bought bundles of clothing that came out to less than 50 cents per item. 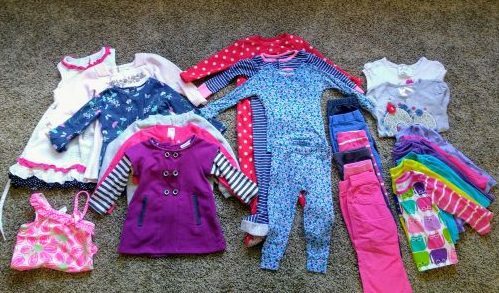 When buying clothing on FB or Craigslist, ask how many kids have worn the clothes. If it’s more than one, the clothes are probably more worn than they are worth. Also ask if the home has pets or smoking. Although you can wash clothes, I usually pass on these items too. Always meet in a public place to buy or sell, and try to take someone with you, just to be safe. But what if breastfeeding doesn’t work for you? That’s totally fine and normal, and there are still ways to save on bottle feeding. If you plan to pump, you might be able to get a breast pump for free through your insurance. Ask your health care provider to write you a prescription for a breast pump. Then call your health insurance company for instructions to order your pump. I ordered mine online from a site that offered multiple models and styles. I selected the one I wanted, submitted my insurance information, and the pump was shipped three days later. Breastfeeding is a huge money-saver, but there are ways you can save on formula as well. Formula can be expensive, costing between $80-$100 per month or $960-1200 for the year. But my friends who use formula swear by Costco’s Kirkland brand of formula. The ingredients list is identical to the Similac brand, and their babies are healthy and thriving. They spend about $35 per month, for a savings of $780 for the year. But of course, always ask your pediatrician which formula is right for your baby. If you qualify for low-income programs, WIC can provide formula and other foods for free. Check with your local office to see if you qualify. We never bought jars of baby food. At $1 per jar, the baby food company is literally marking up their product 100% or more. We didn’t buy gadgets to make baby food. I already have a blender, plus I don’t want to store anything else in my kitchen. You could also use a food processor. When baby was ready for solids I’d just puree or mash whatever fruit or vegetable we were eating and offer it to her. It’s honestly easier than planning baby-specific foods. We also did a lot of baby led weaning type foods, and she seemed to prefer it over purees. At most, I spent an extra $1-$5 per week on extra vegetables or snacks. What Baby Gear Do You Need? We were graciously given a car seat, a crib, a swing, a Lille Baby carrier, a Rock ’n Play bassinet, and we borrowed a Pack ’n Play. Had we purchased all of these ourselves, we would have spent a total of $673. We would have bought the crib, swing, carrier, and Pack ’n Play used if we bought them ourselves. I didn’t buy a diaper bag; we had three backpacks in the closet already, so I didn’t see the need for another one. 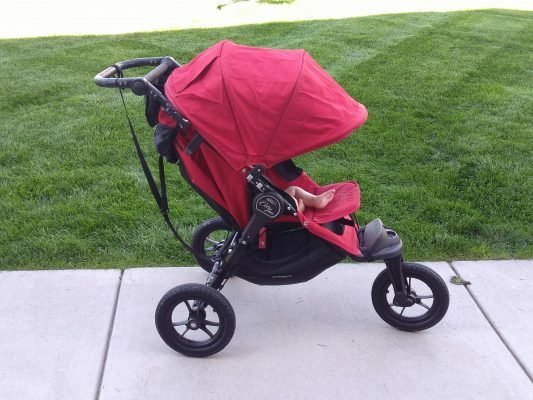 A NOTE ON BUYING USED BABY GEAR: One thing you cannot buy used is a car seat. You have no way of knowing if it was in an automobile accident, so it is not recommended to buy one used. Save up to buy a new one. Cribs can be purchased used, but do not buy or accept a drop-side crib. They have all been recalled for safety. Likewise, ask for the manufacturing info on a used crib or stroller and check for safety recalls before buying. If you buy baby gear from a consignment shop, they will have checked all the safety recalls for you. When buying baby gear, try to limit the number of items you buy. It’s a pain to store a bunch of stuff, and it’s expensive to buy. Here are a few tips for buying baby gear. You can get a Pack ’n Play with an infant insert to use instead of a bassinet and crib. Bumbo chairs, activity centers, swings are nice, but they are only usable for a few months before baby outgrows them. Friends are often willing to loan swings, Pack ’n Plays, and carriers, which saves them storage space and you money. Don’t buy blankets unless you really need them. We received several as gifts, but only ended up using two muslin blankets and two warmer blankets. The only gear you really need is a car seat and a place for your baby to sleep. Everything else is just convenient. If you are worried about paying for expensive items, consider asking your family members to give cash instead of individual gifts. Miscellaneous items we received as gifts included a white noise machine, a thermometer, gripe water, and a few books and toys. Had we purchased them ourselves, our cost in this category would probably have been $263. The nightgown and belly wrap were purchased to soothe my anxiety about delivery and recovery, and I didn’t even use them. They were the most expensive items on this list, and without them, the cost in this category would have been $75. Did you know the costs of labor and delivery vary drastically depending on where you give birth? In the U.S., the average vaginal delivery costs between about $5,000 and $10,400, while the average C-section delivery costs between about $7,400 and $14,500. See the averages for your state here. These numbers do not include the costs of caring for the baby in the hospital after birth. The above numbers can be hard to swallow. However, keep in mind that insurance should reduce these numbers. There are some other steps you can take to make sure you are not paying more than necessary. Do you qualify for Medicaid? 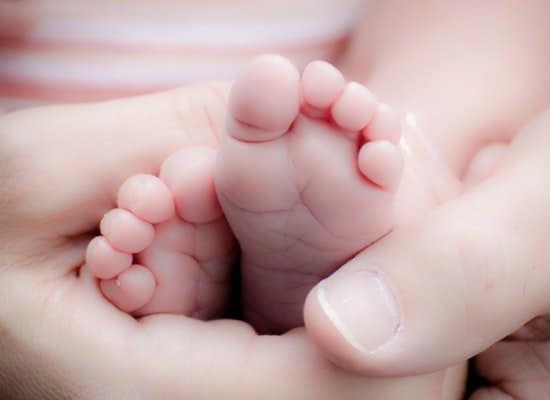 If you qualify for Medicaid, you may be able to receive prenatal, labor and delivery, post-delivery hospital care, and baby’s first year of medical expenses at little or no cost to you. Contact your local office to see if you qualify. Make sure your healthcare providers and facilities are in your insurance network. Choosing an out-of-network provider or facility will likely cost you significantly more out-of-pocket. Make sure you check with your insurance company to make sure you stay in network. If you opt for an epidural or need a C-section, beware that you could end up with an anesthesiologist who is out of network. Be sure to check with the hospital about that before labor (since you likely won’t be thinking about it while in labor). Find out if there are benefits in paying up-front. Many hospitals offer discounts if you pay your portion either before the birth or before you are discharged from the hospital. Be sure you know what they are including in your portion. Often there are more charges added depending on which type of delivery you have and what additional supplies are used. Some baby procedures might be less expensive if done in the doctor’s office. If you are planning on a circumcision or immunizations for your baby, they could be less expensive if you opt to have them done in your doctor’s office. Call your insurance company, hospital, and doctor’s office beforehand to find out. Understand that you pay for everything. The hospital will charge for everything (and I mean everything). Don’t ask for additional items without expecting to be charged for them. Read all fine print and double check everything! A hospital bill can be a bit intimidating to read through. Page after page of medical jargon that you don’t understand can be easy to skip over. However, you want to be sure you aren’t being charged for anything you didn’t really use. If you have any questions, ask. Just a note for these categories: we spent $0 on healthcare and childcare in the first year. We were incredibly fortunate to have an extremely healthy year. Baby didn’t get sick a single time all year, so we didn’t visit the pediatrician outside of wellness visits that were 100% covered by insurance. However, we didn’t plan on that. Most children get sick often, so you should plan on visiting the pediatrician several times. According to a study by BMO Harris Bank, the average out-of-pocket costs for the first year of medical care for a baby is $1,297 (which includes hospital costs after delivery). If your baby is more or less healthy than most, those numbers could be higher or lower. Look up what your insurance co-pay is and work it into your saving plan. If you have access to an HSA, it’s a great way to get tax benefits and pay for health care. Childcare is probably the most expensive category for the year. 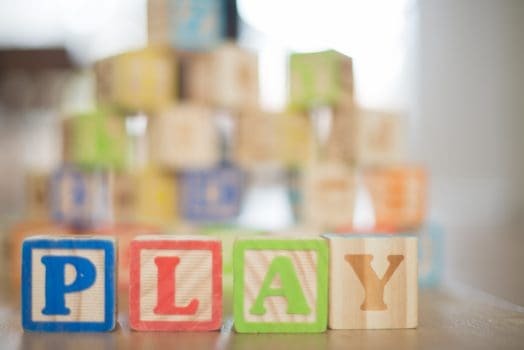 In the United States, the average cost of daycare for a newborn is $211 per week. That varies depending on where you live. As you plan for your baby, calculate what childcare will truly cost you. Consider your time and added commuting for dropping off and picking up, extra doctor visits, and the cost of formula. Shop around and visit multiple child care facilities before choosing one. Friends or family may also be willing to babysit for less than what you’d pay at a daycare center. You and your spouse may be able to work out more flexible schedules with your employers to be home more. With a little planning and creativity, we were able to easily fit a baby into our budget for far less than the national average. Having a baby is wonderful and joyful, so don’t let financial stress rob you of any joy. The key to frugal living is finding joy in the things that don’t cost money. Was my daughter the best-dressed baby on the block? No. Do I carry a super trendy Freshly Picked diaper bag? No. And I’m totally fine with that. My joy in motherhood comes from my baby, not from what she wears or uses. When I look back at this first year of my baby’s life, I don’t cherish the things I bought for her. I cherish her and the memories we’ve made. 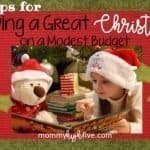 So don’t worry too much about the things on your baby list. 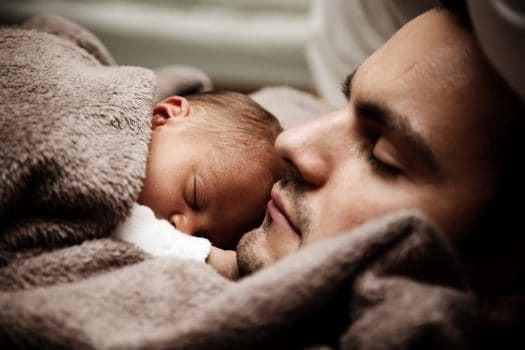 Your baby will bring you more happiness than anything you can buy.